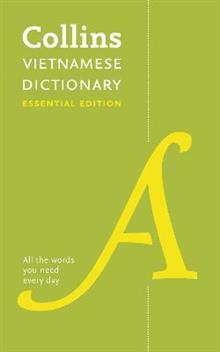 Extensive and up-to-date coverage of Vietnamese and English in a portable format, with a handy supplement of essential grammar points for each language. Designed for all those studying Vietnamese and English, whether at school, for travel or for business. It is ideal for anyone who needs a wealth of reliable information in a handy, compact format. Offers comprehensive and up-to-the-minute coverage of Vietnamese and English. Delivers the accuracy and reliability you expect from the Collins name. With natural, idiomatic example phrases, in-depth treatment of the most important core vocabulary and help to find the exact translation you want. points for both languages.